Fujifilm has announced a one-of-a-kind collaboration with fashion designer Michael Kors. The aim of the collaboration is to “capture the creativity of the fashion and photography worlds” with the introduction of Fujifilm’s new Instax Mini 70 instant film camera. 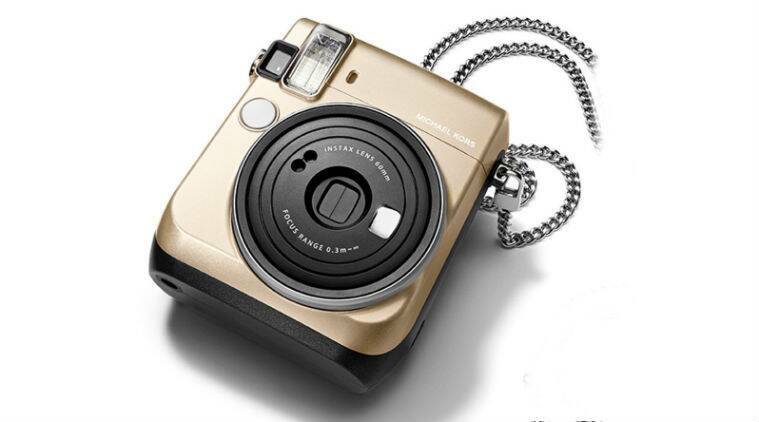 The new Mini 70 instant camera from Michael Kors and Fujifilm comes in a gold metallic colour, which helps capture the aesthetics of Michael Kors designs. The camera has the Michael Kors brand logo on the front of the body, and also includes the designer’s signature in gold on the camera door – as a stamp of approval from Micahel Kors. The camera has an automatic exposure control and an interlocking range (ISO 800). It comes with an automatic electronic flash built-in and a charging time of 0.2 sec – 7 sec. Shooting mode on the camera includes – Selfie, Macro, Landscape, Fill-in Flash, Hi-Key, Auto, and the Self timer Mode gives 1 frame/2 frames continuous shooting. Instax Mini 70 comes with a special selfie mode and flash that automatically calculates surrounding brightness and adjusts shutter speeds accordingly. The exclusive camera will be sold as a bundle, which includes ready-to-use film, and will be available for a limited time beginning in late October.